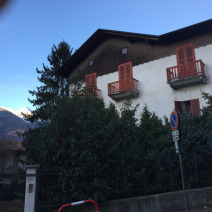 The building is located centrally in Saint Vincent (Aosta Valley) at around 500 mt. from the Casino and the Thermal facility. 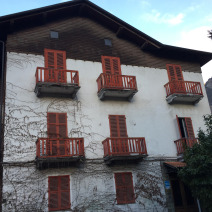 It is a beautiful traditional Alpine structure in wood and cement with a number of balconies. Guests were hosted in around 25 rooms. The hotel has been closed for several years and needs renovations. A redevelopment project developed by a local contractor is available (including drawings, technical measures, etc), on a total surface of 1,300 sqm. Saint Vincent is a renowned touristic destination in Aosta Valley, the North Western mountain region of Italy. 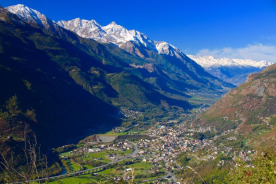 The village is located at 600 meters altitude, along the freeway which connects Turin and France, around an hour drive to both the French (Mont Blanc Tunnel) and Swiss (Gran San Bernardo) borders. It gives perfect access to some of the most magnificent mountains in the European Alps: Mont Blanc (Monte Bianco), Matterhorn (Cervino) and Monte Rosa. 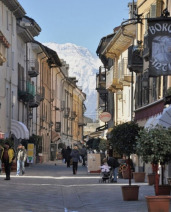 The Aosta Valley includes some of the best European ski resorts like Cervinia, Courmayeur, Champoluc, Gressoney, La Thuile, all reachable in less than an hour by car from Saint Vincent. Saint Vincent’s climate is dry and mild, making it also a perfect summer destination. The presence of thermal water sources (the Terme of Saint Vincent facility has been recently upgraded) and the famous Casino (one of just four in Italy) have been attracting crowds of tourists since the 19th century. The presence of medieval castles all around the valley, the cultural and gastronomic offerings (including award winning wines) and the proximity to large cities like Turin (1 hour) and Milan (1,5 hours) are just few of the attractions Saint Vincent can offer.